Last year Optician’s sporting challenge to raise money for Blind Veterans UK suffered somewhat from inclement weather forcing the main event, a UK-based half Ironman distance triathlon, to be cancelled. In a bid to hit the ground running next summer, and take advantage of some pretty good winter weather, Optician’s editor, Chris Bennett, that’s me, has been keeping up the miles in readiness for the 2019 challenge. The A race for this year is the Alpe d’huez triathlon which takes place, not surprisingly, around Alpe d’Huez in France. With the race day set in late July there should be no repeats of the cancellation suffered for the Sussex Original triathlon last September. The bike has consisted mainly of commuting into Optician’s offices in Hern Hill Brixton and the run off road trails in the Surrey hills. Swimming is a trickier affair. Indoor pool swimming in 25m lengths is pretty soul destroying. The beautiful Brockwell Lido is on Optician’s doorstep. At 50m it’s a fantastic Art Deco feature of south east London, but its unheated and the water temperature is currently under 5 degree centigrade. I can manage about 300m before I lose control of my limbs. But help is at hand thanks to the Surrey Hull Adventure Company, (@the_shac), which hosted a mid-winter swim at its Buckland Lake this Sunday. 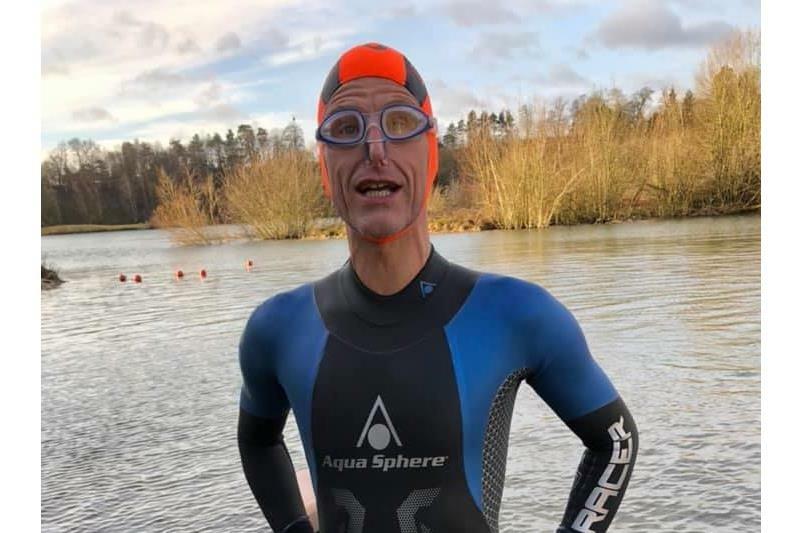 In a bid to get some distance in I donned my Aqua Sphere Racer wetsuit (kindly loaned me the suit for the Sussex Original Triathlon), along with neoprene hat, gloves and booties for a longer swimming session. Most of those at the lake weren’t looking to swim a long distance so I quickly found myself swimming alone. It was a cold but sunny morning with the sunshine bouncing off the water making it look almost summery, my fingers and toes thought otherwise. Chapeau to the woman who completed a few laps of the course in her swimming costume….perhaps I’ll join her next time.